I drove by the unattended ticket booth, knowing that I wouldn’t find the inexpressive teenager’s face handing me a ticket, but I glanced at it anyway. The parking lot spread out unabated without a soul. It rendered me insignificant as I stood by the turnstile; it seemed abandoned and purposeless. A feeling of intense solitude passed through me as I glanced yonder. When I was little, I wanted to find a place where to hide. I would play hide and seek to experience what would it be like being all by myself, until that ‘someone’ would find me. There was always a watchful eye looking after me, at school, even at home. I still think this is a great experience being removed from any prying eye. I started walking towards the camping area. The evergreens stood like lonely giants, one hiding timidly behind the other with a few oaks and maples whispering the approaching autumn. Then I spotted a camper; it was almost blending with the background. I thought that it was purposely planted there. Out of view. The lot continued broadening unchallenged without the presence of cars and people. I felt exposed, although, by now, everybody was gone. A tinge of melancholy overwhelmed me for a moment, recalling those younger days at the end of summer. Although the late September sun was still bright and intrusive, it was not the same. Something had changed. A fine smoky mist slithered in, lingering over the camp. It disoriented me a bit, but I was still able to see the camper. It looked odd, unusual. Neglected. It had out of state plates and it looked like it hasn’t being used in a while. I tried to peek in through the weather dulled window and I cringed when sensed that someone was looking back at me from the inside. A whiff of acrid mustard and old beer turned off my curiosity and I just left. A few thoughts crossed my mind but I didn’t deal with it. I did not want to be near that ‘thing’ any longer. “What prompted me to do this anyway?” I said to myself. An ice-cream truck showed up over the narrow road moving slowly and in silence. It looked out of place. As I followed it with my eyes I developed the sudden desire to hear that repetitive jingle one more time, but it didn’t play it out, it accelerated before the hill, and sped out of sight like a regular vehicle. I was annoyed that it didn’t. I found myself in the middle of the camping area with the trash cans and the fire pits. They were clean and empty, and the tables stacked up for the next season. The bathrooms were locked and the water fountains were shut dried. I wanted to leave, right at that very moment, so I headed back to my car. I did not know my way as I used to, even though I have been here before many times with my parents. 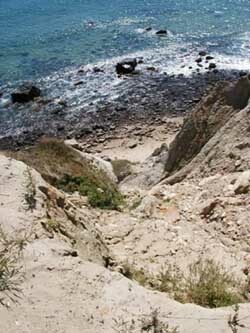 But, all I remember is that there was a passageway through the cliffs to the beach. I knew how to get there. Someplace around here there must be still this path leading to the water. “Somewhere,” I voiced. I put my keys back in my pocket and I decided to search for it; “there was this rocky path, and I am going to find it!” I thought. A young memory retains vividly lasting vestiges of colors and things like gravel under one's barefoot, a sour weed smell of firewood burning in the air; impressions that would be relived throughout your life. A back in time ride only to be experienced anew all over again. I spotted off the path a shallow rocky drop; it was quite steep, and I noticed that I couldn’t climb back should I wanted, but I had to do it, and down I went. Immediately I smelled salty water as the trail became colder and narrower; it felt like closing a door on a sound booth. I heard voices in the distance; casual dialogue of other people’s intimate elusive moments, fluctuating like radio waves. I was touched by a teenager’s first kiss, fascination… tender love, and infatuation. My heart was beating fast. I ran as fast as I could, although I wanted to stop but I couldn’t. The tree branches were whipping my arms, my face. I was in pain; I heard laughter and crying all at once. I thought that I was turning mad, out of control on a slippery slope! Seas of crickets and flying hissing insects were all around. Vortexes of leaves dragged me near to boulders and threatening rocks. I saw tree trunks like giant arms being raised up against me, and falling on my way. I was swiftly taken up in the air twisting and tumbling for an uncertain lapse of time, until all came to a sudden stop. I found myself face down on a sandy beach, I was confused but unhurt. This unexplained occurrence came to an end, as quickly as it started. I opened my eyes, incredulously to divine light and a pleasant silence; to the miracle of a blue sky. I was brought to a calm shore of quiet waves and nothingness far beyond the background. A thought of heaven cross my mind. I took a deep breath, not even trying to understand, as I sunk my feet into the balmy sand, and slowly lay down on my back. My eyes were highjacked to the clouds drifting in a slowly whirlwind, working out different things and faces. Then, suddenly, I spotted the Unfathomable Old Sailor come out of it; that old marine legend that goes around whipping incessantly with his pointer cane the boat’s masts, booms and riggings with a monotonous and ever present clanking. So many people have seen him but can’t describe him. To me he resembles an old bearded man. Yes! The sailor on an old tin can of wheat crackers that my mother used to keep in the cupboard. He’ll be in his water gear for ever; as long as I want I guess. Now he is coming down the beach; this time he is going home, wherever that is. He seems to go backwards at times, further and further unless I keep my eyes focused on him. I will not disturb him. I will follow him with my eyes, and I won’t let him change into something else. Now, I can hear in the distance the jingle of the ice cream truck, and it is coming my way. I couldn’t stop thinking about the unfinished man. “He had no face, and no arms..."